And were overshadowed by God's back. These Saints were from Libya. Having been arrested for confessing Christ, they were brought before the proconsul and governor of Libya. 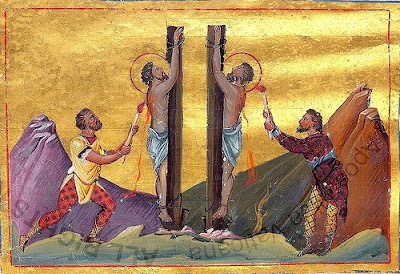 Having remained steadfast in their faith in Christ, they were flogged. Then binding them by their hands and feet, their backs were burned with fire. After this they were pricked with sharp and piercing bricks. Because this torture continued for a long time, by this the Saints delivered their souls into the hands of God, and ascended victoriously into the heavens.